March 2019: Bailey Hewitt and Lianna Lopez successfully defend their MSc theses examining the impacts of climate change on lake ice phenology. Congratulations on your excellent work and defences! February 5, 2019: Our lake ice loss study is featured in today’s New York Times! January 28, 2019: Our paper “Widespread loss of lake ice around the Northern Hemisphere in a warming world” is out in Nature Climate Change. You can read it here and the news coverage in BBC News, National Geographic, CBC, and the Globe and Mail among others. January 5, 2019: Congratulations to Carrie, Arnab, Octavia, Alyssa, and Alex on fantastic presentations at the Canadian Conference For Fisheries Research and Society of Canadian Limnologists annual meeting in London. November 18, 2018: Fantastic SEEDS@YorkU event learning about biodiversity and evolution at the ROM with Iranian, Eritrean, and Sudanese families! November 15, 2018: Our GLEON collaborative paper “Ten simple rules for collaboratively writing a multi-authored paper” is now out at PLoS Computational Biology. Check it out here! October 2, 2018: Why are there water shortages in the world? Fun to make this video: Did YU Know? Summer 2018: Enjoying my sabbatical and fun research trips! June 18, 2018: The Sharma lab was at IAGLR in Scarborough. Congratulations to Bailey, Lianna and Katrina on fantastic presentations! May 7, 2018: A wonderful weekend in Tobermory discussing the impacts of climate change on the Bruce Peninsula. Great to see the local community interested in mitigating the impacts of climate change and protecting the Bruce Peninsula. 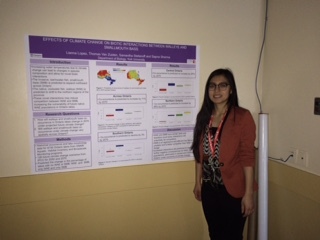 March 27, 2018: Sapna presenting climate change research at the Lake Simcoe Science Meeting. Thanks to Erin Dunlop for the photo! 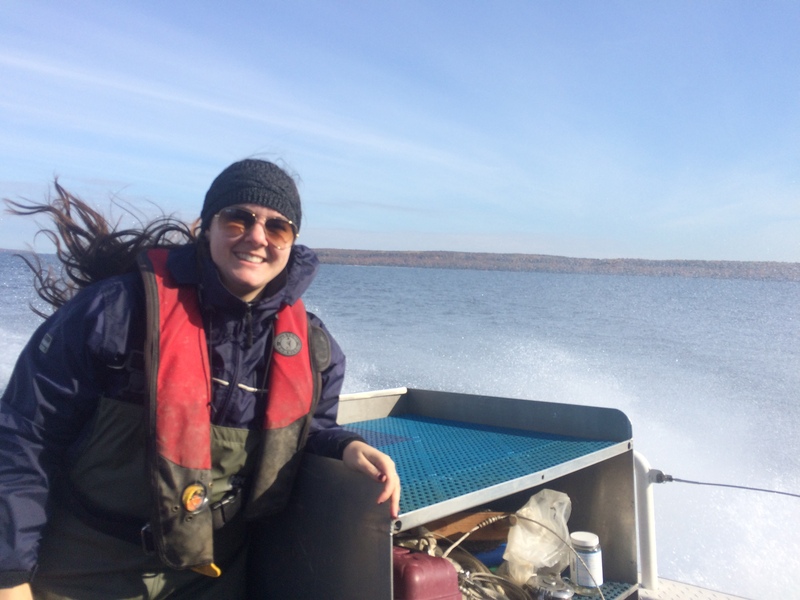 March 21, 2018: Congratulations to Alyssa Murdoch for receiving a WCS Canada W. Garfield Weston Foundation 2018 Fellowship for Northern Conservation to support her research on fisheries in the Arctic! March 18, 2018: Today we visited a sugar bush festival at the Kortright Conservation Centre with families from Syria, Iraq, and Sudan! It was a beautiful day to learn about how maple syrup was produced by indigenous peoples, pioneers, and in the modern era. Our families loved tasting maple syrup for the very first time and learning more about their new country! January 16, 2018: Our paper on predicting the impacts of lake on small north temperate lakes in collaboration with Dorset Environmental Science Centre, IISD Experimental Lakes Laboratory, and the North Temperates Lakes LTER is now published! January 12, 2018: Thanks to the Department of Biology at Wilfrid Laurier University for hosting me for a departmental seminar. Fantastic department and amazing lab facilities! 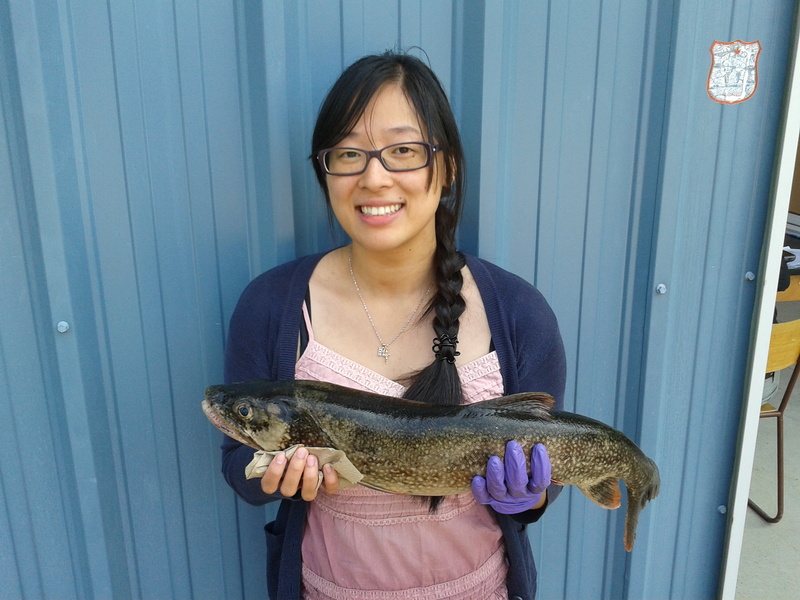 December 20, 2017: Congratulations to Miranda and Lianna on their accepted paper to Environmental Research – Examining the influence of climate on mercury levels in Ontario top predator fishes! 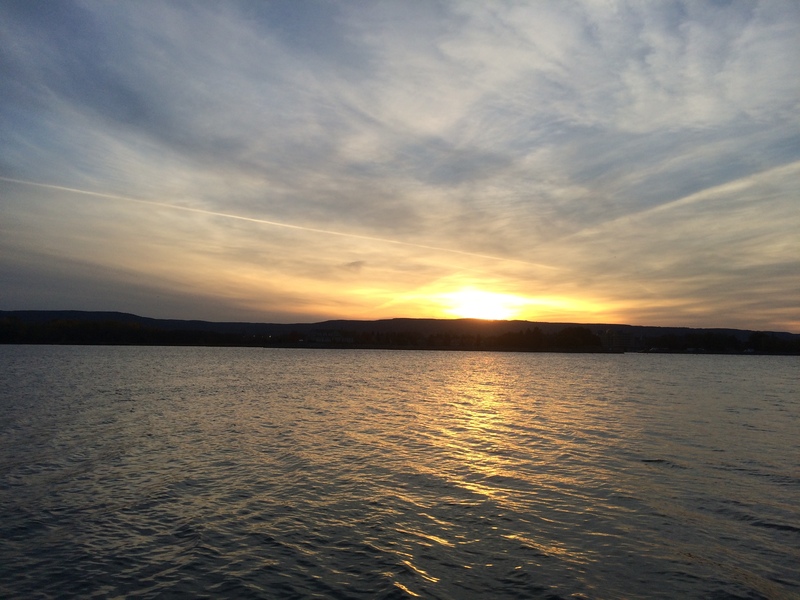 December 2017: Fabulous GLEON meeting at the spectacular Mohonk Mountain House in the Catskills and a wonderful time at the Lake Kinneret Limnological Laboratory. December 3, 2017: Thanks to RCI Science and YorkU Integrated Science students for another fantastic SEEDS event where our families learned about winter and the Arctic! October 22, 2017: Today we went to the Toronto Zoo with refugee families from Chechnya, Syria, Sudan, Ethiopia, and Saudi Arabia. The Zoo put together an amazing event for us with behind the scenes tours with camels, giraffes, and Indian rhinos. Our kids had a fantastic welcome to Canada! October 16 – 20, 2017: Exciting to host Environmental Synthesis Week at YorkU! Fantastic speakers and workshops on statistics and R! September 7, 2017: Welcome to the lab, Octavia Mahdiyan, Arnab Shuvo, Tanzil Sadid, Ika Washington, and Rebecca Hough! August 13, 2017: Alyssa, Lianna, Yvette and Lori joined the Derek Gray lab in Inuvik to conduct fish and water sampling along the Dempster Highway in NWT for our new collaborative project on fisheries in the North. Here’s the sampling crew (photo courtesy of Lori Waters). July 28, 2017: We held our latest SEEDS event at the Blue Whale exhibit at the ROM! A spectacular exhibit with families from Syria, Iraq, Sudan, Somalia, Liberia, and Chechnya. May 2017: The Sharma lab attended and presented at CSEE in Victoria, BC and at IAGLR in Detroit, Michigan. Sapna also had fantastic visits at University of Toronto Scarborough, Canada Centre for Inland Waters, and the Annex Montessori! April 24, 2017: Congratulations to Lianna on receiving the Ontario Graduate Scholarship! April 18, 2017: Congratulations to Bailey on receiving the Ontario Graduate Scholarship! March 28, 2017: Our paper on the impacts of climate change on Ontario woodland caribou populations is now published in Rangifer: http://septentrio.uit.no/index.php/rangifer. March 8, 2017: Congratulations to Lianna, Bailey, Alyssa, and Sapna on receiving their awards at the Faculty of Science Awards Night! March 5, 2017: The Sharma Lab and SEEDS teamed up with the Royal Canadian Institute for Science to attend a Let’s Talk Science fair for newly arrived refugee families from Syria. A fantastic day for all! 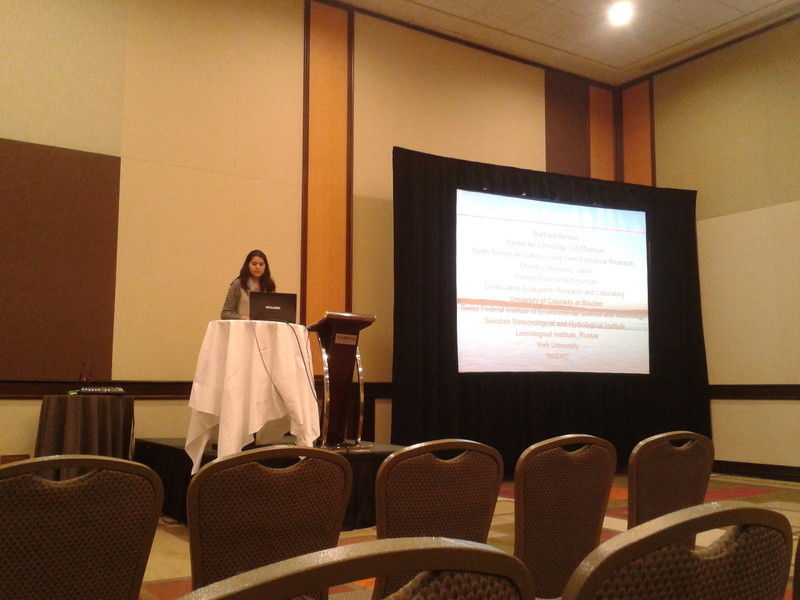 March 2, 2017: The Sharma lab is presenting at the American Fisheries Society – Ontario Chapter meeting in Orillia. January 10, 2017: Sapna presented at the “Everything under the Sun II” climate change symposium at York University. 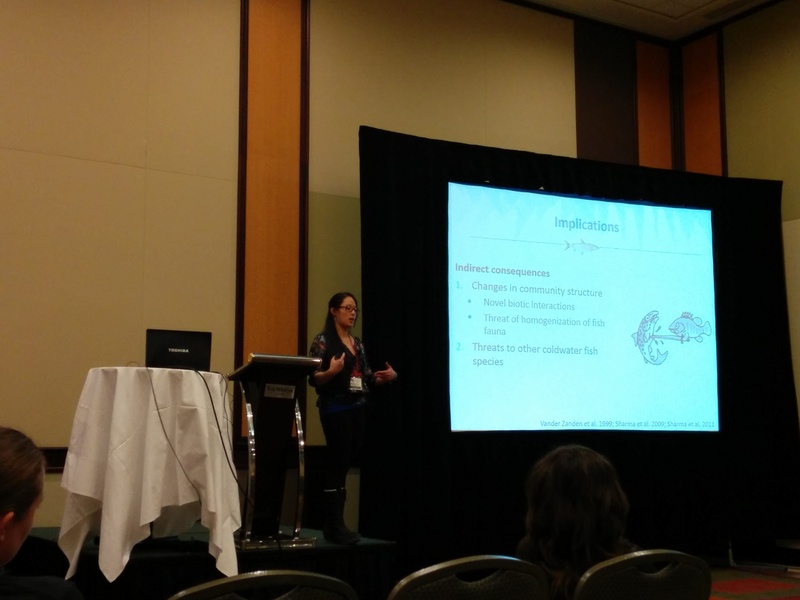 January 5-8, 2017: Our lab presented at Canadian Society of Limnology’s Annual Meeting in Montreal – fantastic conference! November 16, 2016: Bailey presented a Pecha Kucha at the R Meet Up held at York University. October 15, 2016: Thomas will be on the FAN590 at 8:23 am on “Fish’n Canada” talking about our walleye-bass paper. October 6, 2016: Heading to Montreal to celebrate Pierre Legendre’s 70th birthday with a “Past, present, and future of numerical ecology workshop”. Happy birthday Pierre! 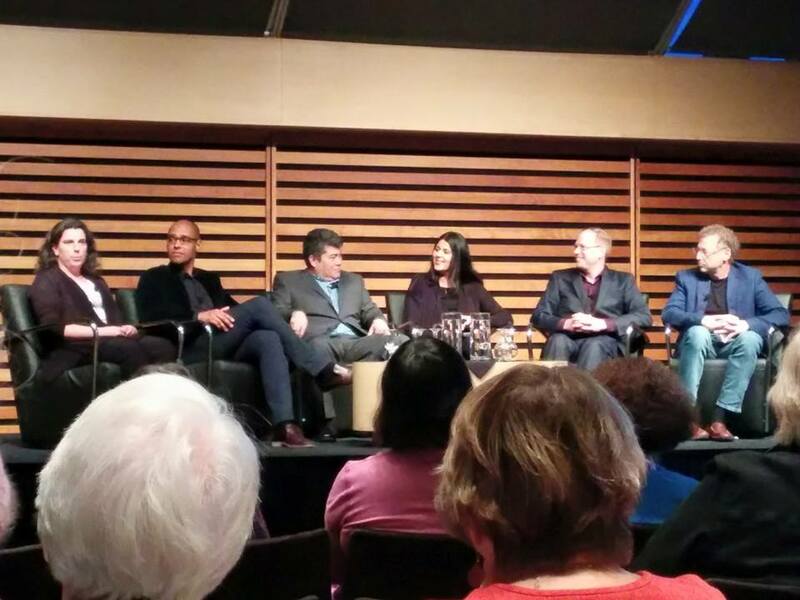 October 5, 2016: On The Agenda with Steve Paikan tonight on TVO. Photo taken by Steve Paikan. September 17, 2016: Another successful SEEDS at YorkU event at Ripley’s Aquarium with families from Syria, Iraq, Sudan, and the Congo! September 7, 2016: Welcome to Alyssa Murdoch, Fabricio Pardo and Leah Turner to the Sharma lab! September 2, 2016: Enjoyed a wonderful trip to Parks Canada and the Sources of Knowledge group in Tobermory to present our research! August 9, 2016: Congratulations to Samantha Stefanoff on a successful Master’s defence! July 23, 2016: Wonderful day spent doing science outreach at the ROM with new Canadians from Syria, Afghanistan, Iraq, Iran, Somalia and Eritrea. July 2016: Samantha at her sampling sites assessing water quality and algal blooms in Lake Huron. July 6, 2016: In beautiful St. John’s for CSEE 2016. June 24, 2016: Our paper on walleye and smallmouth bass interactions under climate change has been accepted to Diversity and Distributions. June 5-10, 2016: Sapna, Samantha, and Bailey are presenting their research at IAGLR in Guelph, Ontario. May 30, 2016: Welcome to Dr. Ryan Sorichetti, a new post-doc in the Sharma lab and Ontario Ministry of Environment and Climate Change! May 27, 2016: Fun day with the anti-money laundering, global markets, communication, and IT groups from HSBC for Earthwatch Water Day! 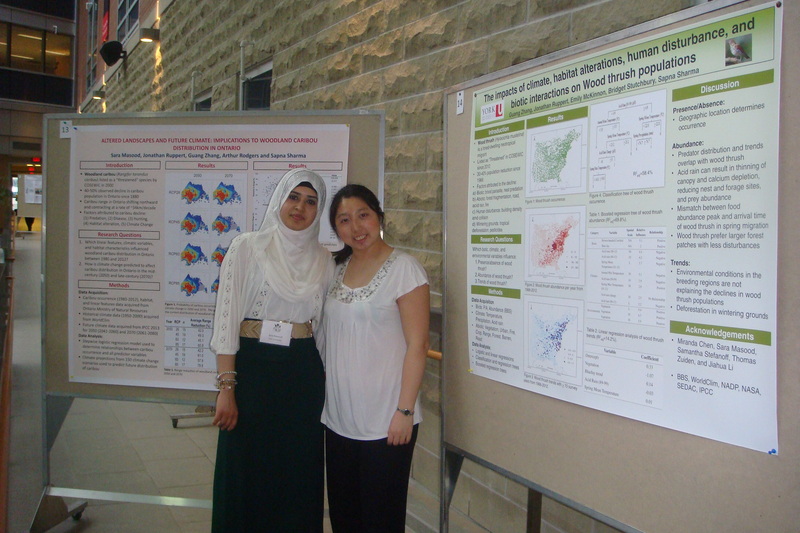 May 13, 2016: Katrina and Samantha presented posters at the Biology Symposium at York University. May 5-7, 2016: Samantha, Katrina, Bailey, and Lianna represented the Sharma lab at OE3C at the University of Toronto. April 18, 2016: Congratulations to Bailey Hewitt on winning the Enbridge Graduate Award! April 8, 2016: Happy to join the Royal Canadian Institute Science Council! April 4, 2016: Our research featured on Toronto’s subways, buses, and streetcars! 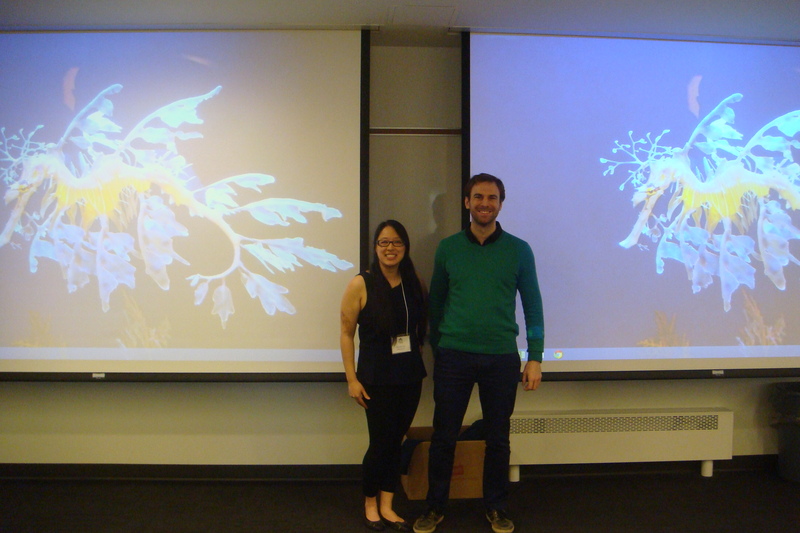 February 29, 2016: The lab had a great weekend presenting our research in Orillia for AFS-OC! February 8, 2016: Great day with Nick Mandrak at York! December 14, 2015: Congratulations to Miranda on successfully defending her MSc thesis! Good luck in Tennessee – we will miss you at York! The lab will not be the same without you! December 11, 2015: Our lab paper “Projected impacts of climate change on three freshwater fishes and potential novel competitive interactions” has been accepted by Diversity and Distributions. December 3, 2015: A wonderful day at Ryerson University presenting the departmental seminar. November 27, 2015: Congratulations to Miranda for winning best poster at Science@50 Biology Day! November 24, 2015: Congratulations to Samantha, Katrina and Bailey on their awards presented at the Faculty of Science annual awards ceremony! 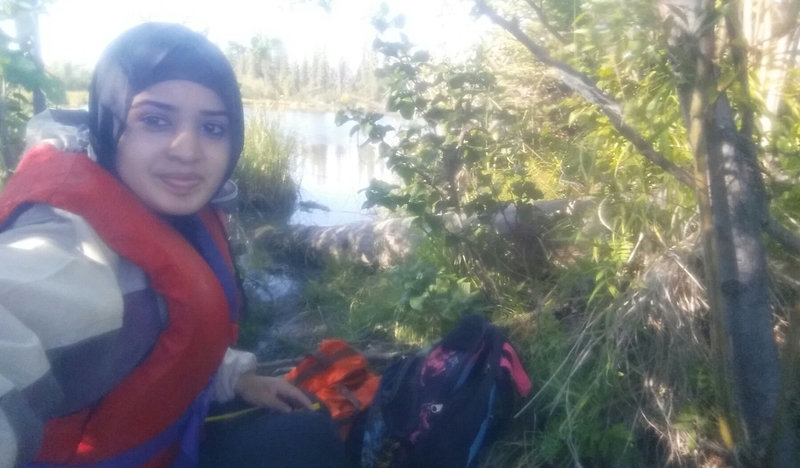 October 26-29, 2015: Samantha has been out sampling in Lake Huron with the Ontario Ministry of Environment and Climate Change collecting data. 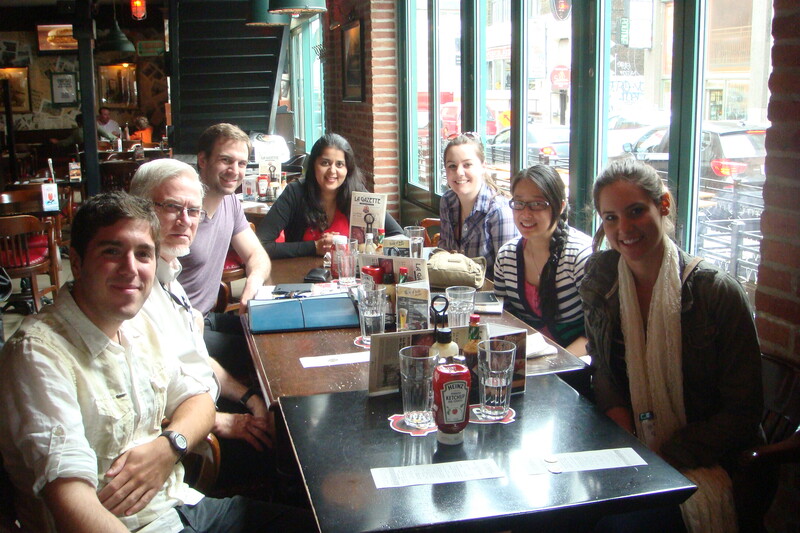 October 12-18, 2015: The Sharma lab welcomes John Magnuson to Toronto. Super productive week working on lake ice dynamics. 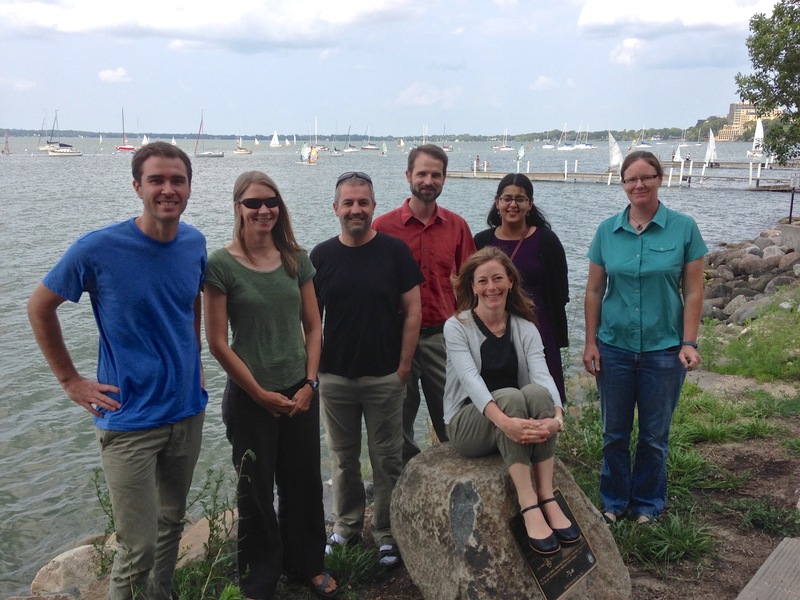 October 2015: Under-ice ecology meeting in Madison, Wisconsin. Fun times synthesizing data analysis! September 24, 2015: The lab attended the Climate Change Aquatic Invasive Species workshop at U of T. Cool research going on in Ontario and Quebec! 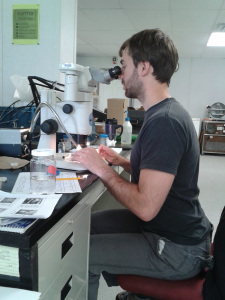 September 7, 2015: Welcome Bailey Hewitt to the Sharma lab! August 2015: Congratulations to Thomas on submitting his thesis chapter to the Canadian Journal of Fisheries and Aquatic Sciences – Can walleye beat the heat? July 2015: Pleased to join the Editorial Board at Nature Scientific Data. May 15, 2015: Ontario Ecology, Ethology, and Evolution Colloquium was a huge success this year (www.oe3c.org). Congratulations to Miranda, Samantha, Thomas, Lianna, and Katrina for co-organizing an amazing conference and great presentations! May 13-15, 2015: York University is hosting the Ontario Ecology, Ethology, and Evolution Colloquium this year (www.oe3c.org). 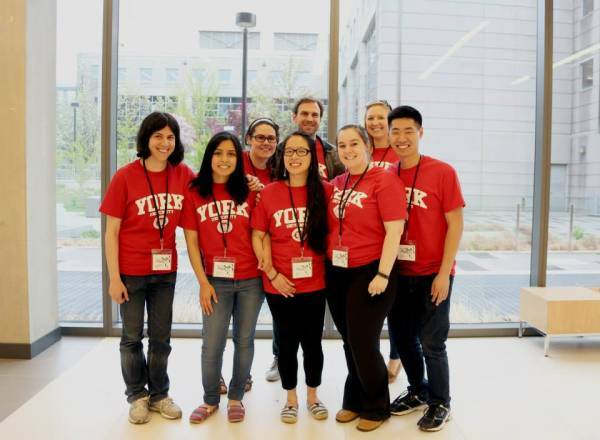 Huge congratulations to the organizing committee, including Miranda, Samantha, Thomas, Katrina, and Lianna from the Sharma lab! 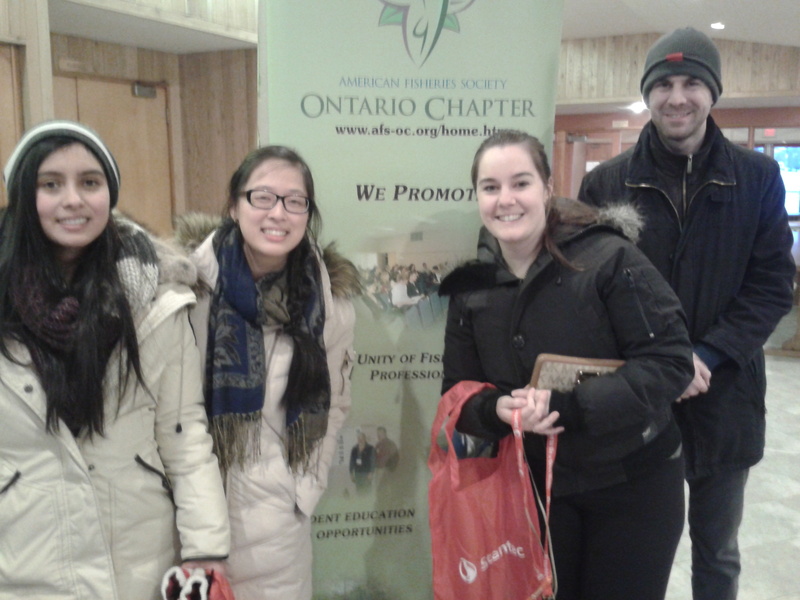 February 26-28, 2015: Miranda, Thomas, Samantha, and Lianna representing the Sharma lab at AFS-OC in Orillia. Huge congratulations to Miranda for winning the E.J. Crossman Award for best student talk and to Lianna for her first presentation at a conference! January 23-28, 2015: Busy, but inspiring week meeting ecologists in Ontario, first by giving a departmental seminar at UTM and then at the Muskoka Watershed workshop. January 10, 2015: Thomas, Miranda, and I are at CCFFR/SCL in Ottawa this weekend. Great talks! January 7, 2014: The lab has submitted our paper on the future of woodland caribou in Ontario under climate change to Global Change Biology. 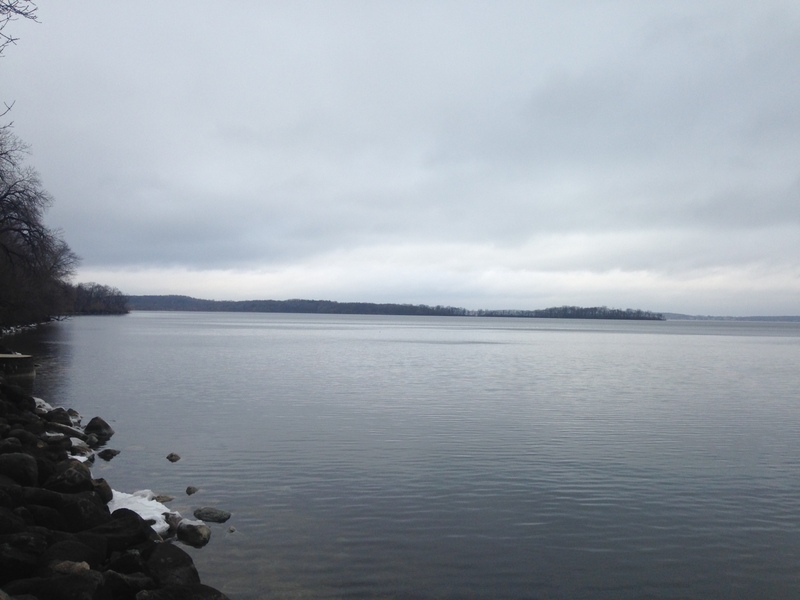 December 22, 2014: Great location to collaborate with John Magnuson on our latest ice project! December 15, 2014: Thomas, Miranda, and Samantha have submitted our paper entitled “Impacts of climate change on fish from three thermal guilds: Evidence of range shifts, expansion, and contraction” to Global Change Biology. December 5, 2014: Congratulations to Japnam Padda on her successful defence of her Honour’s Thesis! November 28, 2014: Great week in Dorset for the inaugural meeting of MELTDOWN. November 12, 2014: Just submitted the GLTC Data Paper to Nature Scientific Data. November 11, 2014: Our paper “Multi-decadal regulation of algal abundance and water clarity in a large continental reservoir by climatic, hydrologic and trophic processes” has been accepted by the Journal of Great Lakes Research! September 12, 2014: Sara and Guang have submitted our paper entitled “Have two decades of acid rain recovery had a positive impact on Wood Thrush abundance?” to Conservation Biology! 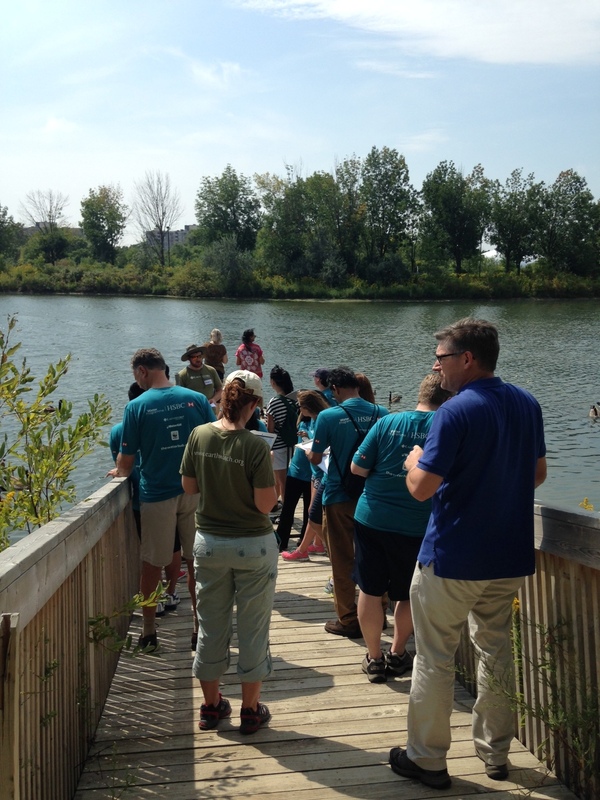 September 5, 2014: Fun day doing water quality outreach with HSBC at YorkU! September 2, 2014: Welcome Shekhar, Katrina and Lianna to the lab! 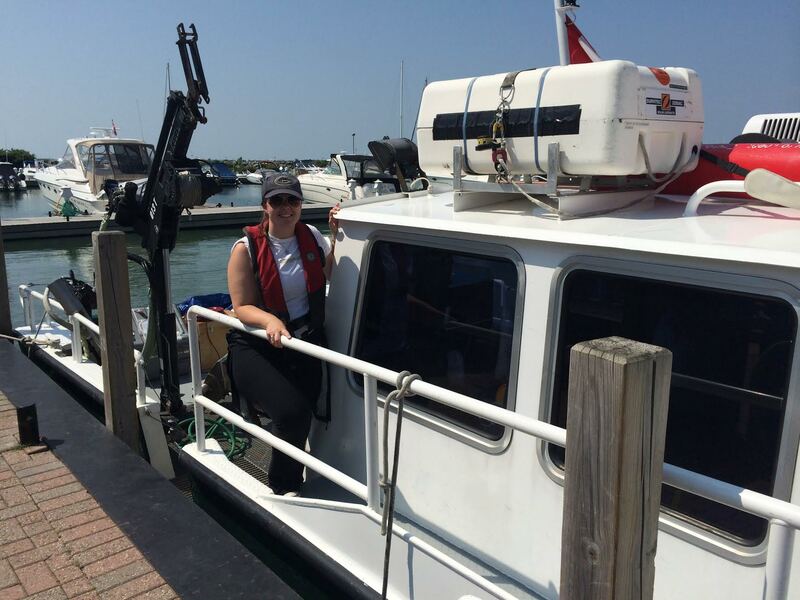 August 18, 2014: Samantha is on Lake Erie this week doing field work with the MOE! August 14, 2014: Goodbye and good luck to 3 Sharma lab research assistants: Anam, Guang, and Sara as they move on to graduate school. Thanks for a fabulous year – we will definitely miss you! 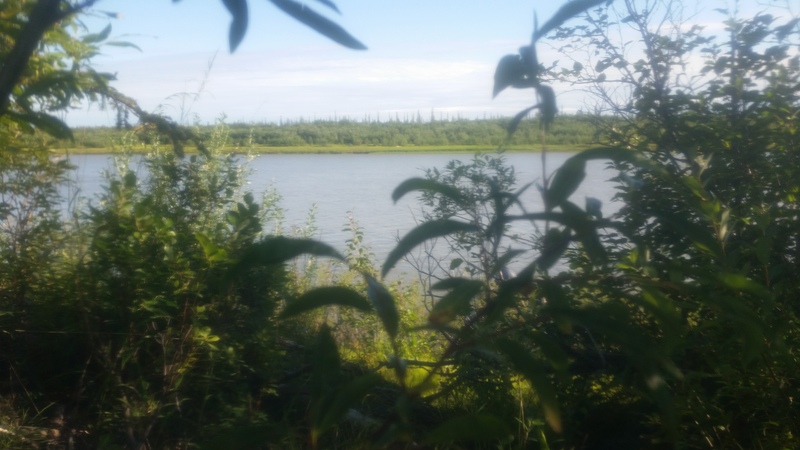 August 6, 2014: Sara is working hard in the Mackenzie Delta River! July 28, 2014: Busy research travel week for the lab with Guang, Miranda, and Thomas doing fieldwork in Muskoka, Sara doing fieldwork in Inuvik, Northwest Territories, and Sapna in Madison, Wisconsin for ice and water temperature collaborations. July 13, 2014: Rich Vogt, Peter Leavitt and I submitted our recent paper entitled “Multi-decadal regulation of algal abundance and water clarity in a large continental reservoir by climatic, hydrologic and trophic processes” to the Journal of Great Lakes Research. 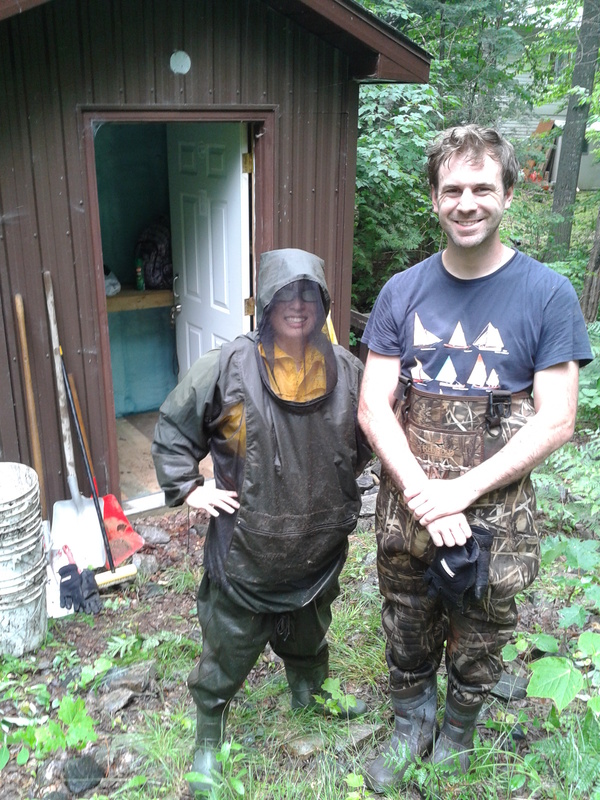 July 1, 2014: Miranda and Thomas up in Muskoka doing field work for the summer. May 26, 2014: The lab is in Montreal this week to present at CSEE 2014. May 19, 2014: In Portland for JASM 2014! 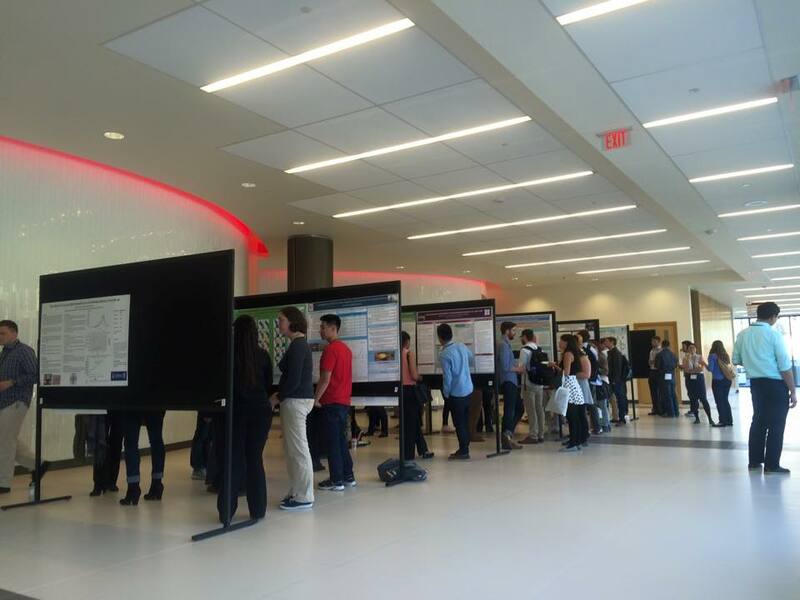 May 10, 2014: The students of the lab present at their first conference – OE3C in Guelph! April 30, 2014: Great day visiting the Smol lab at Queen’s University! Lots of interesting discussions after my seminar! April 28, 2014: Welcome to Anam Qudrat – an NSERC summer student to the lab! April 14, 2014: Congratulations to Guang Kun Zhang and Sara Masood for successfully defending their Honour’s theses! Guang examined the environmental factors contributing to declines of wood thrush populations in North America and Sara predicted the effects of climate change on woodland caribou populations in Ontario. Looking forward to having Guang and Sara spend their summers as Research Assistants in the Sharma lab! April 5, 2014: Sapna Sharma and John Magnuson’s paper entitled “Oscillatory dynamics do not mask linear trends in the timing of ice breakup for Northern Hemisphere lakes from 1855-2004″ has been accepted for publication by “Climatic Change”. March 19, 2014: John Magnuson is visiting the Sharma lab this week. Looking forward to his seminars and collaborating!